The story is set on the high seas where a gas tanker is high-jacked by terrorist under the control of the Senate, who put it on tow to a high-jacked cruise liner, which is used as a human shield. 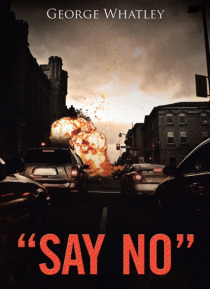 The terrorists want to sail the convoy to New York harbor and blow it up, causing devastation in an act of revenge. The only chance for Jeff and his friends have for saving themselves is if the passengers… take back the two ships before they reach American waters; otherwise, the Americans will blow the gas tanker up, killing all the passengers. The main action takes place off Sable Island near Nova Scotia, the notorious area known as the Atlantic graveyard, where history will tell there has been the loss of over three hundred ships. The flashback of when Jeff first came in contact with the deadly Senate, he was a well-known local environmentalist and was wanted for terrorist crimes he did not commit. The only way he can prove his innocence and stay alive is by pretending to be dead, return to a devastated Estuary area, search for his family and the truth. The evidence of corruption he finds that threatens to destabilize the government must be exposed at all costs Jeff is hunted by a professional killer of the Senate called Wilson, who must destroy him and the evidence before Jeff can expose it. In this part of the story, the action is set against a background of the aftermath of an explosion of biblical proportions at a gas terminal in the Estuary. The thought-provoking reality is that it could happen for real, and the establishment knows it, and they have to plan for the worst-case scenario.